Our Readymade Open Source Hindu Religion Matrimonial Software is designed with advanced search bar filter to reduce the complexity of the searching with user flexibility. Where the user can simply register their account with valid mail id &passwordand we also provided the Two Factor Authentication log-in for the users to provide user secure account. The users can select their membership plan for their individual account to search for the perfect groom. We have introduced different search portals for the users to search for the perfect partner like Quick Search, Advanced Search and Profile ID Search. The admin can act as a major role by managing the entire site by viewing and managing the user account details,membership payment details, transactions details and success story details etc. 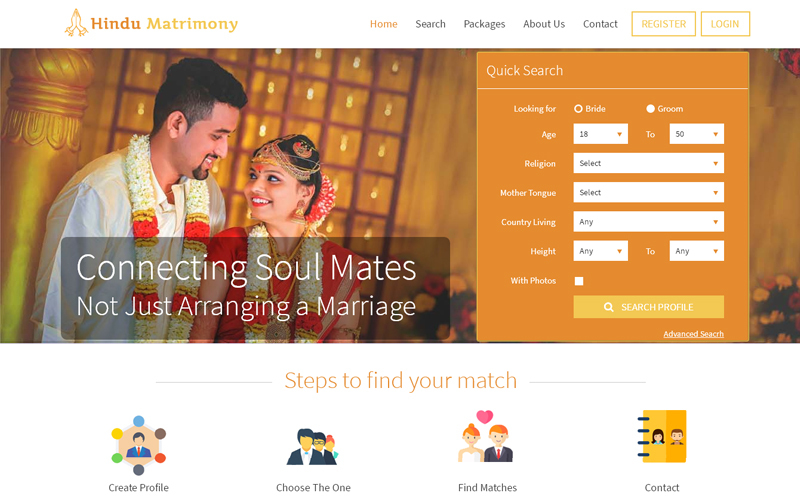 This Vivaah Matrimonial Script is one of the best revenue model scripts for theadmin to gain profit from the membership commission, Google advertisement and banner ads etc, and also the site title, logo, and templates are can be changed by the admin, this script act as the dynamic web page. Vivaah PHP Matrimonial Script has nice front end and back end. Feel very much flexible to access the codes. My website was live within two days, no issues found since 6 months so far. Clear coding and user friendly structure. I don’t have such knowledge in coding, so sales and support team is important to me. I used their service with blind faith and gut feel. I totally surprised by the level of professionalism and helpfulness of scripts mall team.